Visits to the Lightbowne area of Moston in the late 1950s were a delight. My maternal grandad, a retired railway goods guard, lived on Hanson Road and one of his brothers on Hugo Street. Two more brothers were in Blackley and Collyhurst, with a sister in Harpurhey, but another brother lived on Attleboro Road, before moving to Eccles, and my mum’s sister was at Adrian Street: quite a little clan! 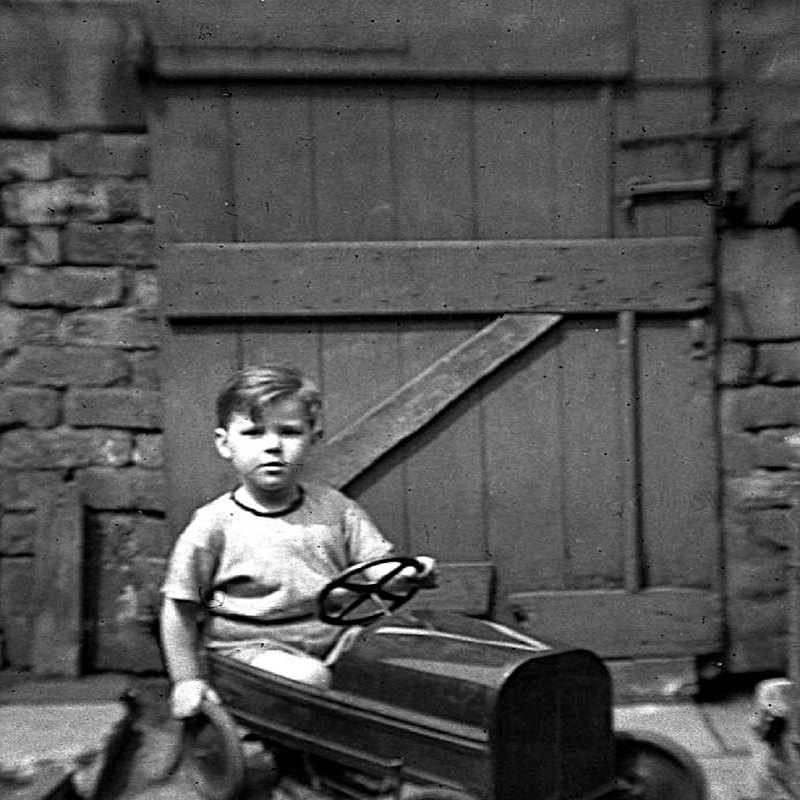 The author, aged about four, in the back yard of 5 Hanson Road, Moston. Every couple of weeks or so, we would stroll down Nuthurst Road, St Marys Road and Jackson Street (now Joyce Street) to perform our family “state visit” to Hanson Road, often spending an hour or two at other addresses, depending who was in. My grandparents were the sort of people who always had time for the kids, and their house, though a humble two-up, two-down terrace, with donkey-stoned front step and a small back yard, was always spotless and full of interesting bits and bobs. First World War brass shell-cases, polished up as bright as gold, small but colourful flower-beds and hanging baskets, home-made rag rugs in front of the coal-fired iron range, and a lean-to kitchen that always smelled of Fairy household soap. There was also a harmonium in the parlour but, as was still common in those days, we rarely went in there – that was for special occasions, like weddings and funerals! And, of course, children never went upstairs without being invited: Edwardian protocol was still very much in vogue. The loo, if you needed it, was in a brick lean-to in the yard, kept brightly whitewashed. Once, my grandad took me upstairs for the view out of the front bedroom window, which overlooked Lightbowne carriage sidings and the engine sheds at Newton Heath. If the adults had some serious chatting to do, I would occasionally be left to my own devices. My two sisters were usually there, too, but one was only a toddler and the other old enough to join in the adult conversations, so both tended to stay in the house. I would drift off, exploring the myriad back entries (no-one called them alleys, then) or kicking a ball around with local kids. As I got a little older, I would sometimes be trusted with a message for one of the other nearby kinfolk, or sent on an errand to one of the shops that almost every street corner had. 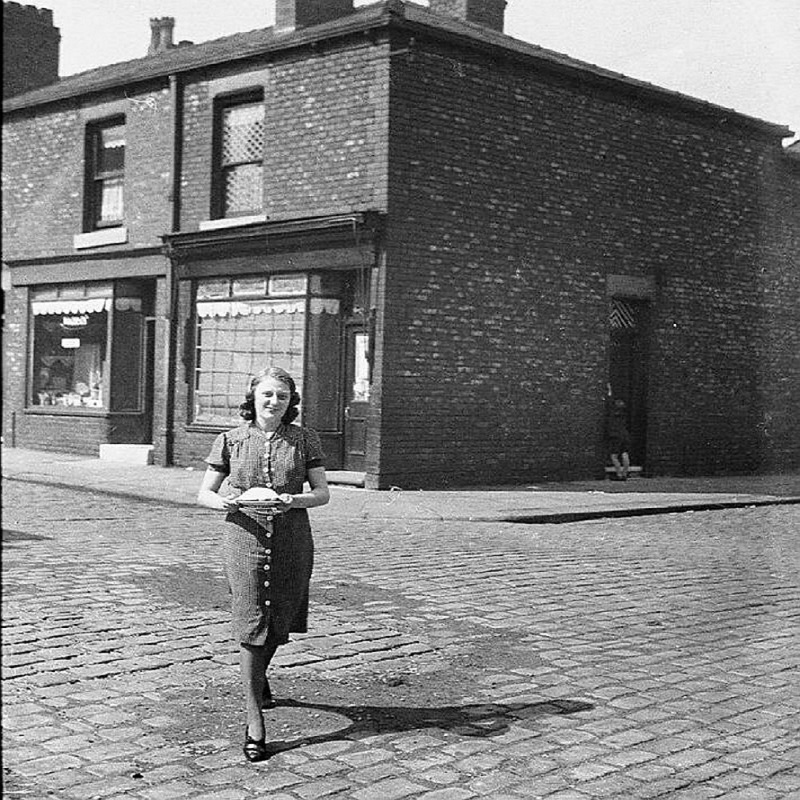 Mum crossing Egbert Street near Langworthy Road in 1940. Mrs Mazza’s was the shop on the left. There was a cluster of shops along Egbert Street, not far away, the most memorable of which was Mrs Mazza’s ice-cream parlour, at number 33. She would sell you a cone or wafer, of course, but her speciality was catering for parties or tea-time treats. You could take a baking-bowl and ask for, say, two dozen scoops, with or without raspberry sauce, to be dished out back at the house. It was proper iced cream, too, made on the premises and with a consistency like compacted snow, unlike some of the slithery synthetic stuff available nowadays. Over the years, I have frequently been surprised at how many people still remember this shop – you inspired a generation, Mrs Mazza! Sadly, my gran passed away in 1967 and, shortly afterwards, grandad elected to move to a retirement home in Eccles, close to his youngest brother. Not long afterwards, the southern end of Hanson Road, including grandad’s house, was demolished, along with part of Hugo Street and the whole of the carriage sidings site. Further house clearances continued into the 1990s (when the last shops on Egbert Street went) and only a few terraces at the northern end now remain.